The Peterborough Telegraph the day after Posh's 1961 defeat at Aston Villa. Peter McNamee was so good when Posh lost 2-1 at Aston Villa in the fourth round of the FA Cup in 1961 he was was compared to the great Sir Stanley Matthews. Posh were on the way to the Fourth Division title in the first Football League campaign in the club’s history when they were drawn at home to a Villa team who had been promoted to the First Division at the end of the previous season. Action from Aston Villa v Posh in a fourth round FA Cup replay in 1961. Posh drew the first game 1-1 at London Road in front of a then club record home gate of 28,266 and few gave them much chance in the replay at Villa Park four days later, certainly not the home faithful in a vast crowd of 64,531, the largest attendance ever to watch a Posh match. But they were almost confounded as Posh, led by brilliant winger McNamee, delivered a superb performance before accepting a 2-1 defeat. Northern Ireland international Peter McParland scored both Villa goals. “Many people have told me it was the beat I ever played for Posh,” McNamee, who still lives in the city, said. “And they are probably right. “I remember picking up the national papers the next day and one headline read: ‘Matthews couldn’t have put on a better performance on the wing than McNamee’. Posh winger Peter McNamee's shot flies into the Aston Villa net. “That was very satisfying, although at the time we were all very disappointed we hadn’t won. We played very well as a team, but then that team used to play very well most weeks! “What a forward line we had - Billy Hails, Ray Smith, Terry Bly, Dennis Emery and me. They were all a joy to play with. “My goal was nothing special. I just arrived in the penalty area following a cross from the other wing, from Billy Hails I think. That made it 1-1, but they scored again straight away and we couldn’t pull it back again. “It was a fantastic game though and a fantastic atmosphere. The interest in Posh in those days was incredible. We had thousands in the ground that night and thousands locked outside as well because the ground was full. The teams from the 1961 FA Cup tie between Aston Villa and Posh. “I was marked by Vic Crowe who kicked me non-stop. The back of my legs were black and blue, but we didn’t use to worry about things like that in those days. We just used to pick ourselves up and carry on. Vic went on to play for Posh and I used to remind him of that game all the time. “We used to have cup runs every year with that team. They were exciting times. I think football was more fun back then as well. “I used to stand on the left wing and stay there. There was none of this running around everywhere and tracking back. I was paid to attack and score goals so that’s what I tried to do. “I don’t go and watch Posh now. I don’t enjoy football these days and I find it sad they only get gates of between 4-5,000. We used to get that many to watch Posh Reserves in the Eastern Counties League and the population of Peterborough then was only 70,000! 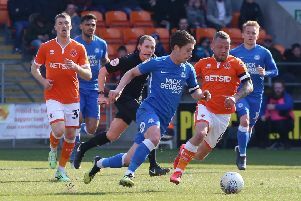 Posh won 4-1 at non-league Dover, 3-1 at Torquay and 2-1 at Second Division strugglers Portsmouth to earn their tie against Villa. McNamee scored twice at Torquay. McNamee, who is 82, is one of only four survivors from the team that played at Villa Park. Left-back Jim Walker, central defender Roy Banham and forward Smith are the others. Walker, Banham and McNamee meet up once a week in the city to reminisce. Smith, who lives in Norfolk, still attends the odd Posh home match.